We’re excited you’ll be joining us this summer – we’ve prepared an awesome camp experience! 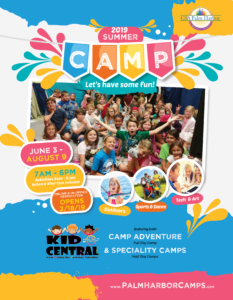 KID CENTRAL 2019 begins on June 3, 2019 and runs for 10 fun-filled weeks through August 9, 2019. Arts, crafts, games, field trips and so much more await your child this summer., and we can’t wait! Registration opens February 18th! To get all the information you’ll need about Summer 2019 at CSA, check our our camp magazine available online – click here or on the cover! Prefer a PDF? Click here. Our full day camp, “Camp Adventure” is a great way for your child to have fun and meet new friends this summer! Your child will experience camp with peers of the same age group where they will discover a variety of activities – they are certain to have a great experience at Camp Adventure this year! Camp Adventure fills up fast and in previous years has sold out for several weeks, so you’ll want to get your child registered soon so they don’t miss out. Every week will be packed with adventure, excitement and surprises. Campers can participate in the full-day camp or combine with one of the half-day Specialty Camps. Each week we will bring the fun to your child and go on a field trip. 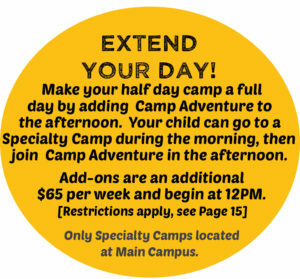 We have scheduled many experts in their field to come offer your child a lasting summer camp experience! We allow 5 year olds in our day camp as long as they have completed kindergarten. Includes all administration fees and a camp t-shirt. Field trips and Before & After Care included. Late fees will apply of pick-up is after 6pm. – Book all ten (10) weeks and pay the deposit before 6/1/19 and get $50 off the registration credit to the cost for the last week of camp. Planned activities from 9 AM – 5 PM. Before and After Care included. Covering a variety of topics from sports to cooking to dance, discover your child’s passion through one of these camps or pick a favorite to improve upon their skill! All are offered for half days (or more) until 12PM at various weeks throughout the summer and all are taught by professionals in their field. Check out our 2019 Camp Guide for more detail about each of these exciting camps! Fee(s), locations and times vary by specialty camp, See camp description for more information. 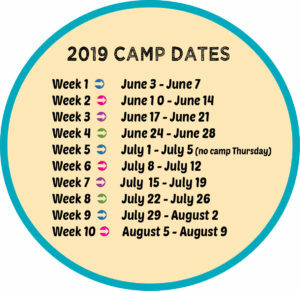 If you add-on Camp Adventure and the Specialty Camp your child is participating in is not located at The Centre, there is no transportation available. Transportation to The Centre will be your responsibility.